Recently upgraded from Actuate BIRT Prof v4.4 to OpenText Analytics Designer [Version: 24.4.0] [Build id: v20180424] with BIRT (v4.8). we had Ecmascript 3 in Actuate, however Opentext (after installation) picked up local Node js as default runtime. Is that might be the issue ? do I need to installe Rhino engine ? 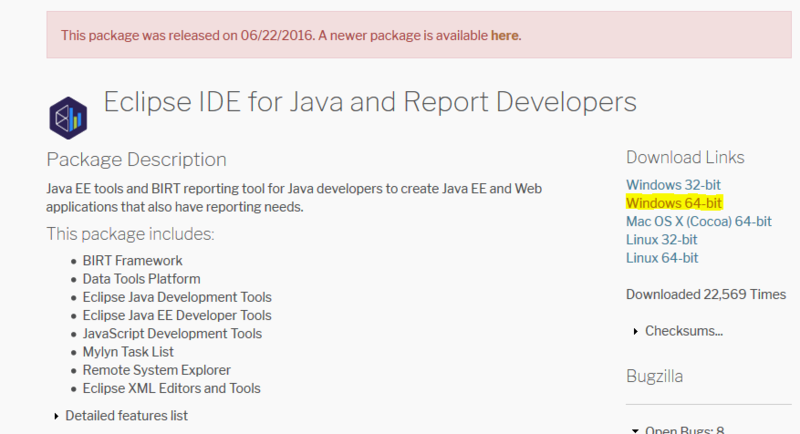 On web page https://eclipse.org/downloads/packages/release/neon/r/eclipse-ide-java-and-report-developers, I did the "newer package" download linked at the top of the page and got the same error you are seeing. Then I tried the download that is highlighted on the screenshot below (Windows 64-bit) and the code ran without error. There appears to be an issue with the newer download.